FAO and AUC. 2018. 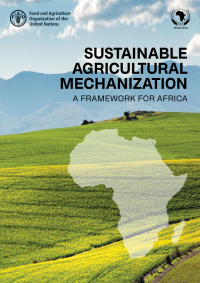 Sustainable Agricultural Mechanization: A Framework for Africa. Addis Ababa. 127pp. 5 October 2018. Rome. The African Union Commission in collaboration with the Food and Agriculture Organization (FAO), launched the Sustainable Agricultural Mechanization Framework for Africa. This framework resulted from a meeting which participants from AU Member States, the private sector, farmers’ associations, civil society organizations, research institutions and academia, held on 11th and 12th May 2017, at the AUC, to validate the draft Framework for Sustainable Agricultural Mechanization in Africa (SAMA). The Framework identifies 10 priorities for AU member states to include in their national plans, ranging from the need for a stable supply of machine spare parts and innovative financing mechanisms, and the importance of regional collaborations that allow for cross-border hiring services. Mechanization in the twenty first century must follow some core principles. It must be built along the entire agricultural value chain, private sector driven, environmentally competitive and climate smart, and economically viable and affordable, especially to small-scale farmers who constitute the bulk of African farmers. Mechanization must target youth, specifically to make agriculture more attractive for employment and entrepreneurship. Cross-border initiatives – for dealers, supply networks and tractor operators – can allow for viable scale and greater utilization. Its implementation will require significant contributions from other stakeholders, including public institutions and private actors such as the European Agricultural Machinery Industries Association (CEMA), which has just renewed its partnership with FAO to work on issues related to sustainable mechanization strategies in developing countries. A significant effort in capacity development will have to be made. To that end, FAO and the International Maize and Wheat Improvement Center (CIMMYT) have also published a training manual to help roll out more effective networks of access to small-scale mechanization services.